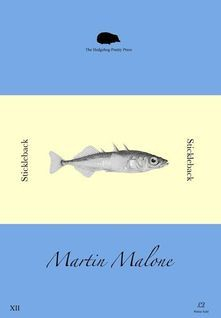 A micro-pamphlet in the Hedgehog Poetry Press Stickleback series. Poems written during the poet's residence at Sumburgh Head Lighthouse on Shetland in 2018. 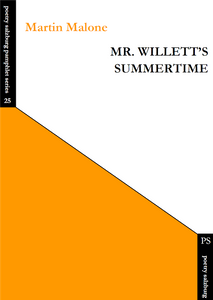 "Mr Willet's Summertime is a poetic seance conjuring culture and personality during 'the suicide of nations'. At once sardonic and elegiac, Martin Malone moves the wheels of history with the blood of his empathy and craft." The Waiting Hillside is a paean to time and memory; a collection haunted by the ghosts of undead moments that walk the here-and-now of our everyday lives. From the emotional panorama of the opening poem ‘At Uffington’, an arc is traced through masculinity, love and family history rendered through the physical and emotional landscapes inhabited by the poems. Time and again throughout this collection, “we rejoin the moment/ driving deep the flint of it into/ the chalky quick” of modern times. Martin Malone charts frankly, the journeys with unreliable maps that constitute the emotionally-layered complexities of 21st century life and relationships. “My road is north/ My road is north”, writes Martin Malone, but in fact his landscapes are not only the Brontes’ and Plath’s Pennines but England’s deep south, Greece Arabia and elsewhere. He ranges in time from the ancient world of the white horse of Uffington to bingo halls, and from Avebury’s ancient past to the courteges of Wootton Bassett. His poems are bold in subject and style; his voice never murmurous but full-throated and confident. As sort of ‘bonus disc’ to go with Cur, ‘Prodigals’ is an eclectic snapshot of Martin Malone’s work at a particular moment in time; gathering together some of the disparate strands of a versatile and ambitious poetry. Poems from an abandoned collaboration knock alongside commissions, a short sonnet sequence, out-takes and the great collapsed star that is The Moult of Ghosts, to create a short collection all the more attractive for its off-mic frankness and verve. "I have always been impressed by his work whenever I have encountered it, so it was a treat to see this nicely produced collection from Shoestring Press. As a poet he is acutely conscious of the energies that animate us … Malone still jumps with a ‘jazz’ of his own, and is more than capable of ‘Keep[ing] the beat’ with the best." ENVOI Issue 174, October 2016.